You need to send something, so you go to Google and type in something like “USPS near me” or “US Post Office near me,” and add your zip code to find the closest location. Then you map the closest Post Office, check traffic to see how long it will take you to get there — and don’t forget to check the hours they’re open. You’ll also want to leave extra time for standing in line… But what if you didn’t have to go searching around Google, then drive across town to a Post Office to pay for postage and mail your packages? With Stamps.com, your next trip to the Post Office can be replaced by walking over to your computer. You can calculate shipping costs, buy USPS-approved postage stamps and then print them out using your own printer. Whether you’re sending a postcard or package, calculating and printing the exact USPS postage from your home or office is easy. Stamps.com works with all kinds of printers including laser, ink-jet, and thermal printers. Whether you want to print postage on an adhesive label or directly onto your envelopes — you’ll have a wide array of printing options for all your letters and shipments. Once you finish printing your postage on your computer and packing your shipments, you can give the mailpiece to your daily mail carrier to pick it up when he drops off your mail. If it’s more convenient, you can schedule a free package pickup online. 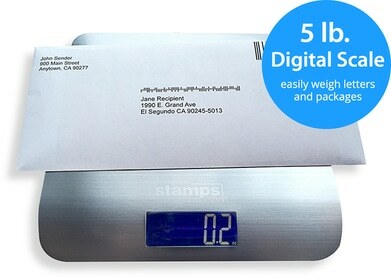 With Stamps.com, all customers receive discounted postage rates that are not available at the Post Office. For First Class Mail letters, you can save five cents on each letter, paying only $0.50 for a one-ounce letter versus $0.55 at the Post Office. And get up to 40% off domestic shipping rates and up to 5% off international shipping rates. If you’re looking for ways to grow your business, opening your e-commerce business to international markets is one of the fastest ways to grow sales. But international shipping can bring complications, paperwork and expenses. With Stamps.com, you’ll have access to automated customs forms that import order information automatically. Plus, get access to special services for shipping merchandise to international destinations using Flats/Large Envelopes. With Stamps.com, you’ll have one central location for all your eBay, Amazon, and online retail orders. Save time by managing and printing shipping labels for all your orders from one simple interface. Plus, Stamps.com automatically updates package tracking information to your data source after each label is printed. With all your orders in one interface, you’ll be better able to process labels faster and monitor your shipping costs easier.